Warrior began active service most inauspiciously. She froze to the slipway when she was launched on December 29th 1860 during the coldest winter for 50 years. Frozen snow covered the dockyard and Thames braziers blazed down the ship's sides but when Sir John Pakington, First Lord of the Admiralty, came to do the honours, she refused to budge. Extra tugs and hydraulic rams pulled her while hundreds of men ran from side to side on her upper deck, trying to rock her free. After 20 minutes, she finally gave way. Sir John smashed a bottle of wine over her bow with the words "God speed the Warrior" The Hon Arthur Cochrane, son of the Earl of Dundonald, became her captain after her commission on August 1st 1861. The ship underwent minor modifications after a sea trial. In June 1862, she started active service in the Channel Squadron, patrolling coastal waters and sailing to Lisbon and Gibraltar. Crowds of up to 6,000 people turned out to see the new supership as she visited British ports. She never once fired a shot in anger. Her strength was her ability to keep the peace. Foreign navies soon imitated her advanced features, and armour-plated lookalikes with even greater firepower rolled down dockyard slipways. Engine designs improved steadily, with coaling stations springing up in ports all over the world. Warrior was obsolete within a decade. She was relegated to the Reserve Fleet ranks and in 1883, withdrawn from sea service. She was now little more than a floating hulk, although still officially classed an armoured cruiser. Her masts and guns were stripped when she was used as a depot ship for two years. Her name became Vernon III in 1904, when she joined Portsmouth-based HMS Vernon, the Navy's torpedo training school. Her role was supplying steam and electricity to neigh-bouring hulks. A year later, another armoured cruiser called Warrior Nobody wanted the old battleship when she went up for sale in 1924. Five years on, she inherited the name Oil Fuel Hulk C77 when starting life as a shipkeeper's home and floating oil jetty at Pembroke Dock in Wales. Some 5,000 ships refuelled alongside her in her 50 years at Pembroke. However, the Royal Navy kept her in reasonable condition with occasional maintenance trips into dry dock keping her hull intact. 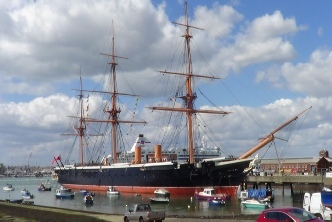 Warrior was the only example of the 45 ironhulls built between 1861 and 1877 to survives launched.